Paul Gascoigne made an emotional return to White Hart Lane in Tottenham's final test event at their new stadium before they host their first Premier League match on Wednesday. About 45,000 fans watched a Spurs legends team, also featuring Jurgen Klinsmann and David Ginola, play against an Inter Milan side led by former boss Jose Mourinho. 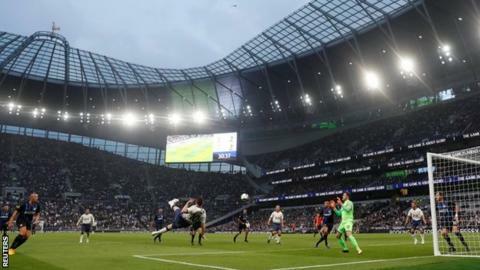 The game was the second to be played at the new 62,062-capacity Tottenham Hotspur Stadium in order to gain a necessary safety certificate. Former England and Spurs midfielder Gascoigne, 51, got the biggest cheer of the evening when he came on to the pitch for a cameo appearance. Former Tottenham and Inter striker Klinsmann played for both teams during the evening. "I'm really honoured and really happy to be here and it is such a special day to get this new stadium going," said the German, a World Cup winner in 1990. "It is very special. Even if it is 25 years ago that I came here for the first time, the way people welcome me is something I will never, ever forget and I will always appreciate." Spurs, who lost the game 5-4, were captained by their former forward Robbie Keane, who was among the goalscorers and performed his trademark cartwheel celebration. Other players involved included Dimitar Berbatov, who scored a towering header, Juan Sebastian Veron, Nayim and Laurent Blanc. The first game to be played at the £1bn stadium was an under-18 game against Southampton on 24 March, which Spurs won 3-1. Spurs will host Crystal Palace in their first Premier League match at the stadium at 19:45 BST on Wednesday.